Above shows the example source code. 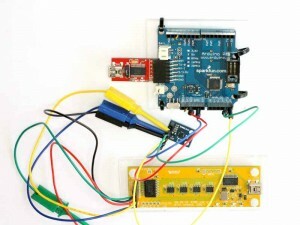 The project uses v1.05 Arduino IDE. Arduino libraries to not maintain backwards compatibility and this code may not run in earlier versions. The project uses an example sketch from Sparkfun. The source code is modified for compatibility with Arduino v1.05 Wire library. Fig 4 shows an analysis of the complete read transaction. in Fig 5 and verify the reading process.